Bone marrow samples taken from 3 patients with myelofibrosis indicated a preexisting B-cell clone. In order to examine the potential relationship, investigators from Austria assessed lymphoma development in 626 patients with myeloproliferative neoplasms, 69 of which had myelofibrosis and were receiving treatment with JAK1/2 inhibitors. Of those receiving treatment with JAK1/2 inhibitors, 4/69 (5.8%) developed B-cell lymphomas compared with 2/557 (0.36%) patients who did not receive JAK1/2 inhibitors (16-fold increased risk; 95% CI, 3-87; P =.0017). The relationship was also confirmed in an independent cohort of 929 patients from the Hôpital St. Louis in Paris with myeloproliferative neoplasms. In that cohort, 3.51% of patients with primary myelofibrosis who received JAK1/2 inhibitor treatment developed lymphomas compared with 0.23% of controls (odds ratio, 15; 95% CI, 2-92; P =.0205). Median time from therapy initiation to lymphoma diagnosis was 25 months. Notably, bone marrow samples taken from 3 patients with myelofibrosis indicated a preexisting B-cell clone. Findings from sequencing further suggest that the clone was the same that ultimately developed into lymphoma. To further confirm the relationship, the investigators developed a mouse model of JAK1/2 inhibition in Stat1-/- mice. Sixteen of 24 mice developed spontaneous myeloid hyperplasia with aberrant B cells. 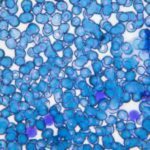 “By replicating this link between this B-cell clone and aggressive lymphoma, we hope to speed the discovery of an alternative therapy for myelofibrosis,” added coauthor Veronika Sexl, MD, noting that the findings will impact clinical care. Please refer to original manuscript for full list of author disclosures. Porpaczy E, Tripolt S, Hoelbl-Kovacic A, et al. Aggressive B-cell lymphomas in patients with myelofibrosis receiving JAK1/2 inhibitor therapy [published online June 15, 2018]. Blood. Bhatt VR, Bociek RG, Yuan J, et al. Leukemic diffuse large B-cell lymphoma in a patient with myeloproliferative disorder. J Natl Compr Canc Netw. 2015;13(3):281-287. Tefferi A, Pardanani A. Serious adverse events during ruxolitinib treatment discontinuation in patients with myelofibrosis. Mayo Clin Proc. 2011;86(12):1188-1191. JAK inhibitors associated with aggressive lymphoma: study suggests screening patients to prevent second malignancy [press release]. American Society of Hematology (ASH). Published June 14, 2018. Accessed June 14, 2018.